Elder Gonzales and Stephen on SKYPE! Our son Stephen (read about him here) is serving a mission for two years in Mexico. Stephen says he thinks he is the only English speaking person in his city. He is having a hard time convincing the Mexican people he is not a native, but from the U.S., and that his Grandmother is Japanese. He is doing well, loves life and the people of Mexico. How do you know when recipe is worth trying. A keeper? One your fam will love? For me, it may be a combo of ingredients I like. Sometimes it’s a combo of ingredients I know work well together. Once in a while, I pick recipes that are stinkers. When I do, I throw out the hard copy or put a big “X” through the recipe ( if in a book), often with the word “ICK” next to it. Then, there are times I get a recipe and I know it’s a winner, before I taste it. A few weeks ago this happened. Sheri and I were having a convo about ground turkey. For the record, I HATE turkey burgers. I know turkey or veggie or tofu burgers are in, but not for me. I think it’s the texture. Spongy. Anyway, Sheri told me about these Ground Turkey Enchiladas with Corn and Cilantro Topping, said she made them for Scott (her hubs), and he loved them. She says “You’ll love them too”. I was skeptical, but after I looked over the recipe, I knew she was right. I’m going to go out on a limb and say this is THE best recipe using ground turkey. I’m not a huge leftover fan, but I ate this for 4 or was it 5? meals in three days. Place the first six ingredients in a food processor, cover and pulse until blended. Do not over pulse. In a large skillet, cook the turkey, onion and garlic in oil over medium heat until meat is no longer pink. Remove from heat, stir in salsa, cornmeal and seasonings. Spoon 1/3 cup turkey mixture down the center of each tortilla, top with two tablespoons cheese. Roll up and place seam side down in a greased 9x13 pan. Lay the tortillas so you have two rows of four tortillas, side by side. Spoon corn mixture over the top. Cover with foil and bake at 350 degrees for 30 minutes. Uncover,sprinkle with remaining cheeseand bake for additional 5-10 minutes longer until heated and cheese is bubbly on top. - We doubled this for a family of 6. -I only used one can (instead of two) of green chilies when doubling the recipe, and only 3 teaspoons of chili powder instead of 4. -You can grill the tortillas on a griddle on both sides till soft or microwave them for a few seconds on a paper towel. -If you want to cut the fat, use half and half instead of cream for the corn topping. Oh my, they look good. I'm always looking for stuff to do with chicken or turkey mince – I think all the additional ingredients in there must make them really moist. Misty, LOVED the book! Did you see it?? And yes, Rosie, the salsa and spices make the turkey moist and flavor packed! This sounds amazing, love all the ingredients and they sound quite healthy too, yum, what's not to like? 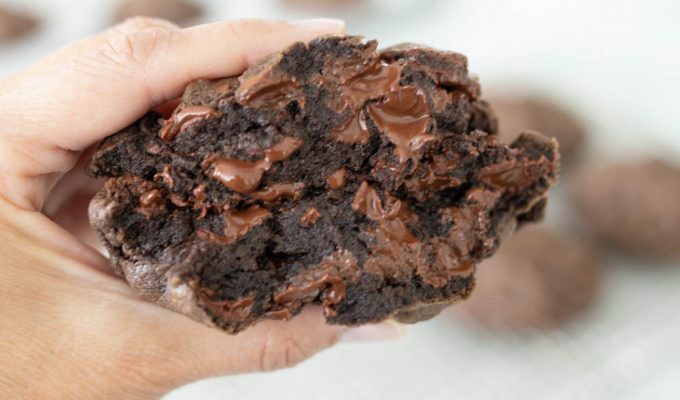 I made these last night and well….delish!! You have to make them! Super simple and well worth the effort. Everybody loved them including my five year old granddaughter! They were not only tasty but we felt we were eating a healthy dinner also. I doubled the recipe and was able to get 12 generously stuffed enchiladas from it. I only had one bunch of cilantro which yielded one cup. This is half of what the recipe called for but honestly, I can't imagine the topping with more cilantro. It was great with just the one cup. I only used the 3 tablespoons chili powder and they were plenty spicy for us. I fell short about 1/2 cup on the red salsa, but it didn't make a difference. Let these cool a bit before serving…otherwise they will fall apart. All in all, super good recipe and I will make this one over and over again. Thanks Si!!! These are delicious. I will be making these soon!!!!! These look so good, I will definitely be making them soon! Made these last night for dinner. So yummy! Also tried the salad de maison. Loved it. Thanks for the great recipes. I didn;t have a can of green chiles on hand so I used a jalapeno for the topping. It was very good but SPICY! I will be trying again with a can of green chiles.